Life is about more than sport. Colin Kaepernick takes a knee before the 49ers' game with the Seahawks. IT WAS THE hottest of takes on Sunday evening. For the Carolina Panthers to lose at home to the Minnesota Vikings — bereft of their starting quarterback and franchise running back — it must have had something to do with the protests going on outside Bank of America Stadium. The city of Charlotte had been on high alert for nearly a week as protesters gathered downtown to mark the shooting dead of 43-year-old Keith Lamont Scott by a Charlotte-Mecklenburg police officer. Those tensions escalated further on Wednesday of last week when another man – Justin Carr — died after sustaining gunshot wounds as the protests turned violent. In the wake of the second death, North Carolina Governor, Pat McCrory, declared a state of emergency and there was even talk of moving the game from Charlotte. However, it went ahead on Sunday and the only protest involved 100 people kneeling outside the stadium as the national anthem played. Inside the stadium, and to surprise of some as he wore a Martin Luther King quote on his t-shirt in the warm-up, Carolina Quarterback Cam Newton did not take a knee during the Stars and Stripes. Indeed, the only protest against the anthem came from Panthers safety Marcus Ball raising his fist. At the press conference after the game, an encounter in which they were resoundingly beaten by a rival for the NFC title, Ron Rivera was asked repeatedly if the events in Charlotte during the week had affected the team’s build-up to the fixture. “I don’t think that’s fair,” he said. The loss leaves Carolina with as many defeats as they had all of last season but they can take some heart from the fact that both came at the hands of probable playoff teams. But there are bigger things than sport at play here. Athletes protesting is nothing new. Indeed, black athletes in particular often find themselves having to take a stand on social justice issues. But the reason that the likes of Muhammad Ali and Jackie Robinson are held in such high esteem and Colin Kaepernick is regarded as the most hated athlete in America is because we like our protests to be in the past. 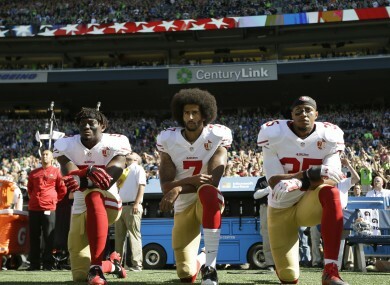 It’s much easier to criticise our predecessors than take a look at ourselves and how we — the human race — have fostered a society where the simple act of taking a knee during a song provokes such hatred and anger when the extra-judicial killing of unarmed black Americans he is protesting is often greeted with a shrug of the shoulders. Last week, former Super Bowl winning head coach — not to mention Hall of Fame tight end — Mike Ditka told a radio station in Dallas that Kaepernick should “get the hell out” of America. Mike Ditka is an idiot. The undercurrent of Ditka’s argument, one he may not even realise he’s making himself, is that Kaepernick and people like him, whose ancestors were slaves, who were uprooted from their own country and upon whose blood and sweat the United States of America was built, should leave. It’s exactly that attitude, this othering of black Americans by people who know nothing of their struggles, that has led us to this situation. Last week also produced another, far more interesting take on the Kaepernick protest from Richard Sherman, Seattle Seahawks defensive back and no friend of the San Francisco 49ers quarterback. Earlier this month, Sherman supported Kaepernick but suggested he maybe could have chosen a different form of protest. “This country is the same country that had ‘whites’ and ‘coloured’ signs on the bathroom. “We’re still in that country, we’re still in that nation. And that needs to be acknowledged and that needs to be changed. There are people with that mentality that still exists, and that needs to change. There are people who still treat people of colour with subjectivity. “They treat them a certain way. They categorise them. They put them in a certain category. There are certain statistics that are put out there to make sure police profile certain people in certain neighborhoods, and that needs to change. “So there is some depth and some truth to what he’s doing. “I think the last couple of days a couple more guys have gotten shot and killed in the middle of the street. “More videos have come out of guys getting killed, and I think people are still missing the point. It’s not right for people to get killed in the street. I think you have players that are trying to take a stand and trying to be aware of social issues and try to make a stand and increase people’s awareness and put a spotlight on it and they’re being ignored. How history will judge Kaepernick remains to be seen but Ali was widely vilified when he chose not to fight in the Vietnam war and his death earlier this year produced millions of words in tribute to the boxer. Of course, you’re probably thinking to yourself that there’s a massive difference between being the best boxer to ever live and a back-up quarterback with one of the worst teams in the NFL. But it shouldn’t matter. Colin Kaepernick has right on his side and, as long as unarmed black Americans continue to be killed on the streets, more and more players will take a stand by taking a knee. Email “The Redzone: As more black Americans die, Colin Kaepernick's protest speaks louder than ever”. Feedback on “The Redzone: As more black Americans die, Colin Kaepernick's protest speaks louder than ever”.